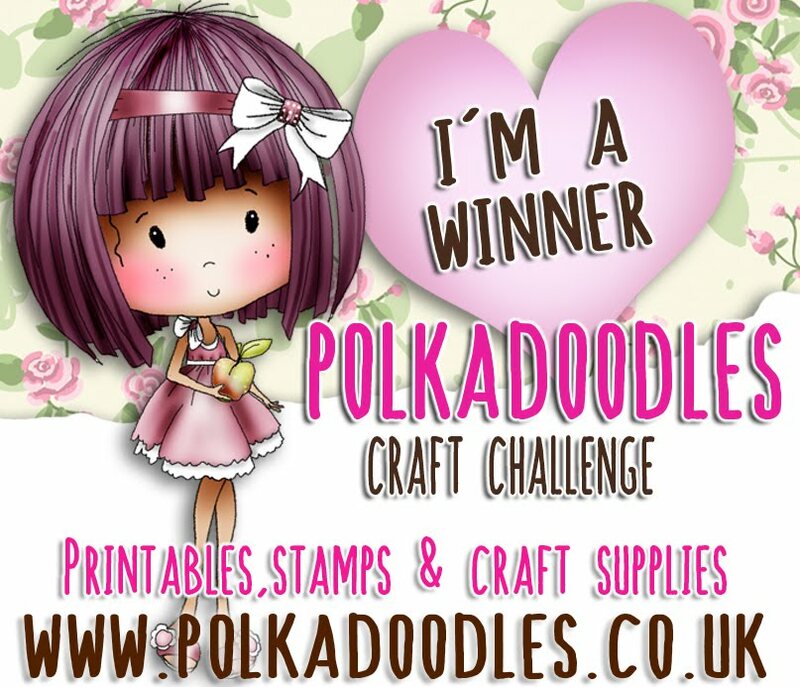 Claire here with this weeks challenge at Polka Doodles - "Mystical and Magical" I strongly believe that daydreaming should be a compulsory part of your day, a little (not too big mind) escape from reality! 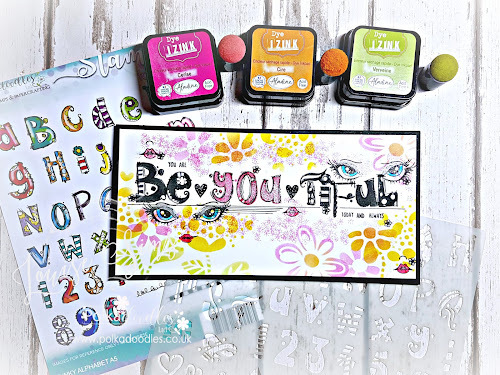 It's also stashbox stamps week here at Polka Doodles so the DT have been playing with other images from their collections and complementing them with Polka Doodles products. Now, the winners of challenge 41....What a great turn out, don't we all love our ribbons and bows! Please email Nikky for your blinkies - the first placed winner receives a download. Please put in the subject field of your email your placing and the challenge number - this will make Nikky's life a lot easier! The challenge is open until Sunday 6 November at 12noon GMT and any entries that do not follow our challenge rules will not be eligible for any prizes so please read them carefully! If you want more detail on how the Design Team have created their projects, just click on their name and you'll be taken to their blog. I think you will agree that it's lovely to see all the fabulous work by the new additions to the DT and of course great work from the stalwarts as well! Claire I adore this Leanne Ellis stamp "Time Flies" and have used a lovely shaped Craftwerk card base. Paperpiecing my image with papers from the Pretty Sweet cd, a lovely tree printed on Safmat and window frame with sentiment set inside courtesy of Double sprinkle of Kraft. Really impressed with the ultra fine nibs for the promarkers which I have used to add stitching and detaining to hair. 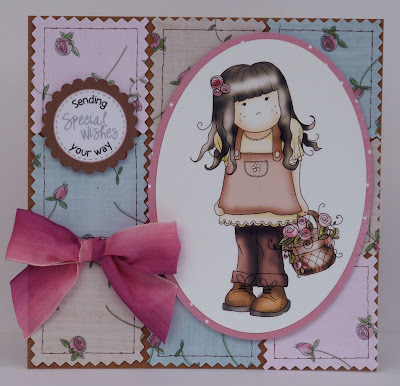 Ruth: I've used a cute Jellypark image, coloured with Promarkers and teamed it with a slightly distressed sheet from Paper Boutique Vol 1 (Star Cake). I've added some faux stitching, buttons from my stash and I've printed the sentiment onto Safmat. 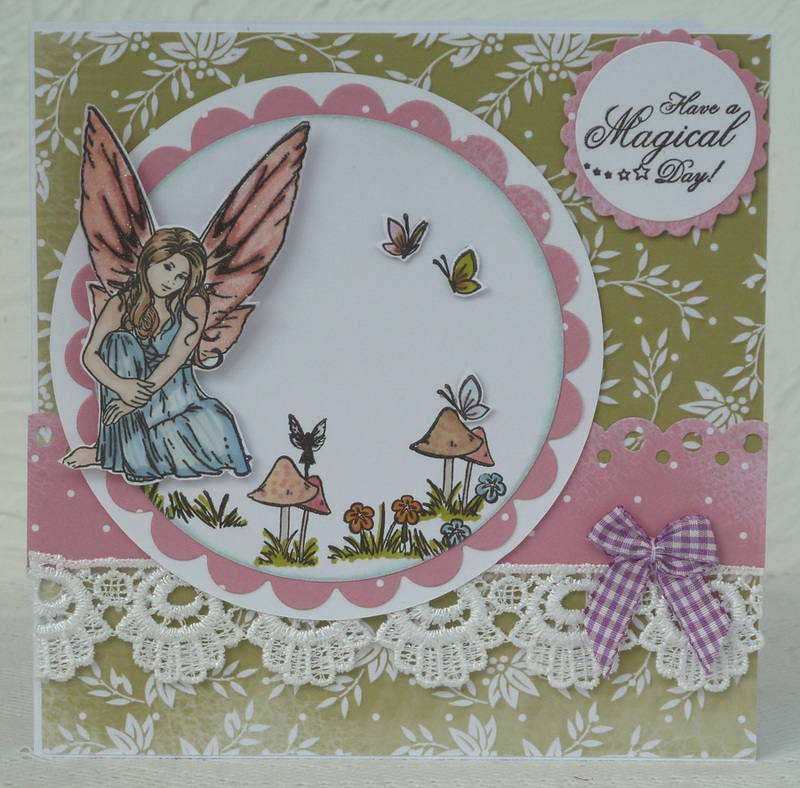 Fliss: I've chosen to use a set of Papermania fairy stamps as I really like their classic look. I stamped a little scene on circle of white card and coloured with Promarkers. 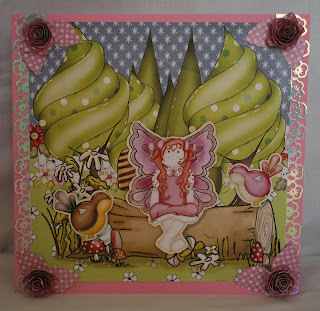 I then stamped the fairy, also used Promarkers to colour, cut her out and added glitter to her wings. 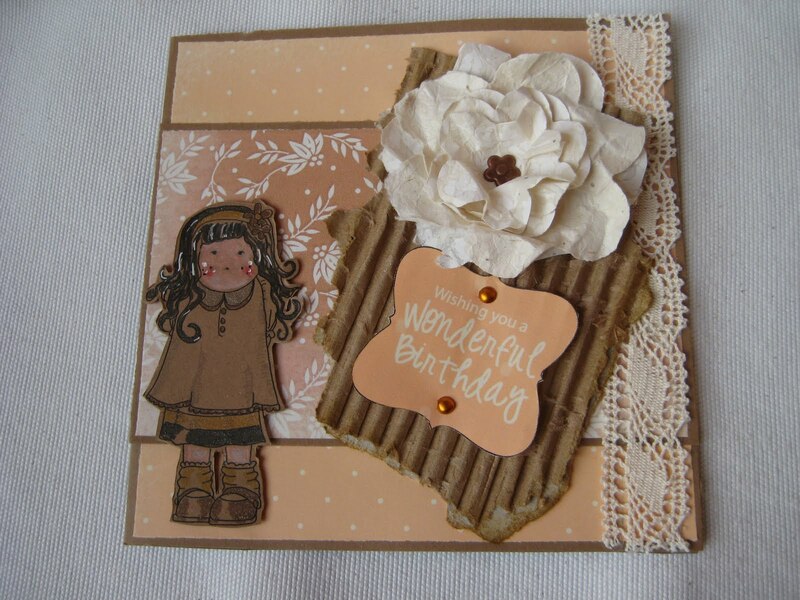 I made up the card using papers from the Pretty Sweet CD and added lace and a ribbon bow to embellish. Louise I have gone for papers from the Pretty Sweet Cd for my card and used a Lili of the valley stamp for my image. 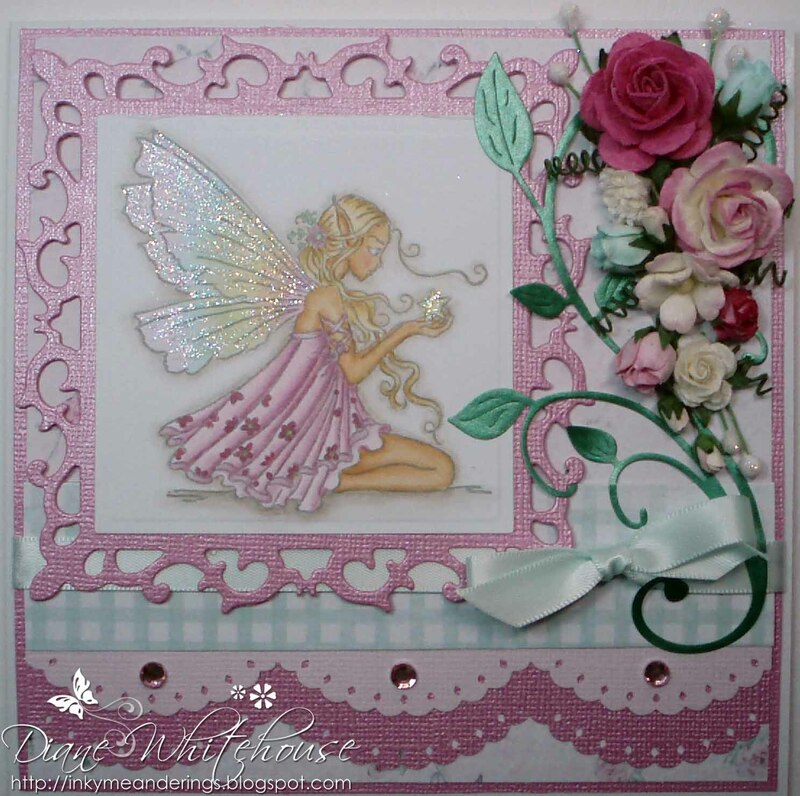 Daniele.....for my magical theme card I'm using a Wee Stamp image called Silver Fairy and I used the papers from A Magical Winter Cd......love the vinatge shades of these papers. 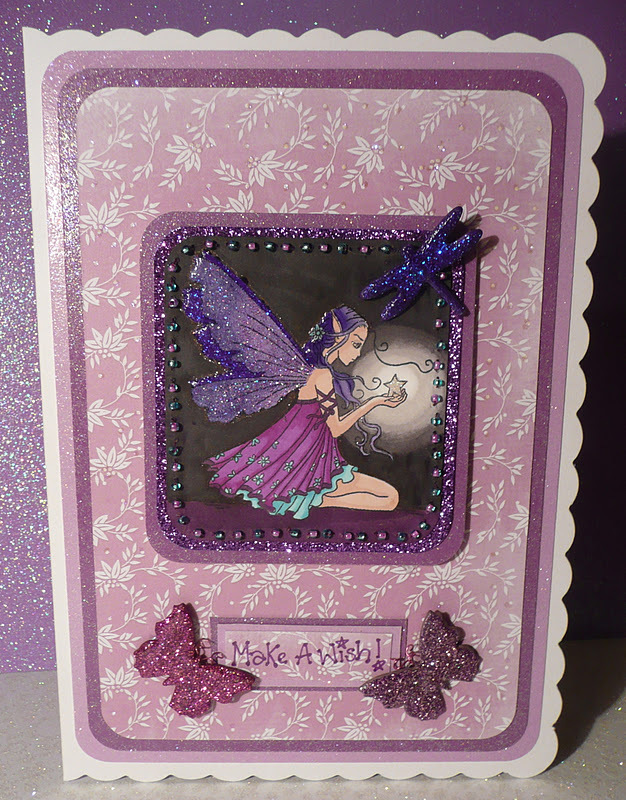 I used chunky glitter inside the shaker card. Diane As soon as I saw the title of this challenge, I knew I wanted to use this fairy image from LOTV and the wonderful papers from the Pretty Sweet CD because they're so delicate and perfect for this fairy. Alan: For this card l used the following cd's from P.D. Sundae of Seasons - Double Sprinkles - Sugar Birdies All the imagery was taken from one of the cd's and again they just fitted in so naturally. Colette - I have made a DL card and used papers from the Sundae of Seasons CD, added some faux stitching and ribbons and gems. 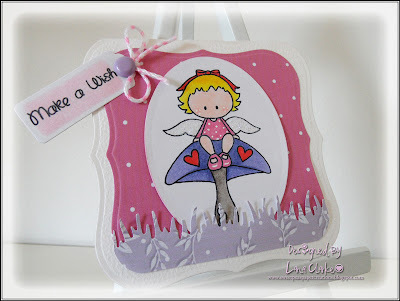 The circle die is from Nellie Snellen and the Holly fairy is a Charmed Delectable Stamp coloured with Promarkers, I added glitter to her furry and frilly bits and her holly berry headband. Lis-m.. I thought I would use a Christmas fairy, as Christmas is a very magical time. The papers are from the Magical winter cd... 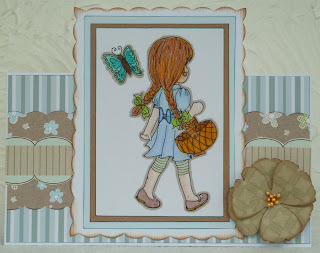 The image is a Sugar Nellie stamp, coloured with my Promarkers, and I have used lots of Kraft card to give a distressed /vintagey feel. 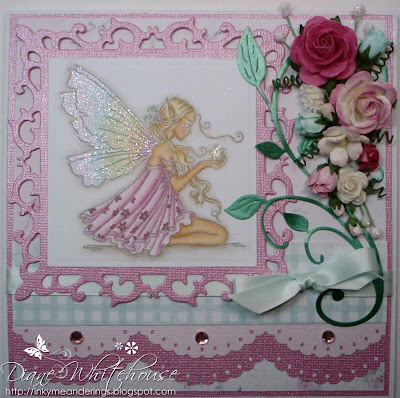 Doreen...for my card I used the lovely Silver Fairy Wee Stamp, which I colored with Copics. The paper and the sentiment is from the Pretty Sweet Cd. Shary I have used a Mo Manning digistamp and coloured it in with Copics. 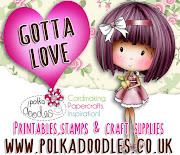 The papers, ribbons, sentiment gems are all from the fab kit by Polkadoodles called Christmas Boutique papercrafting kit. 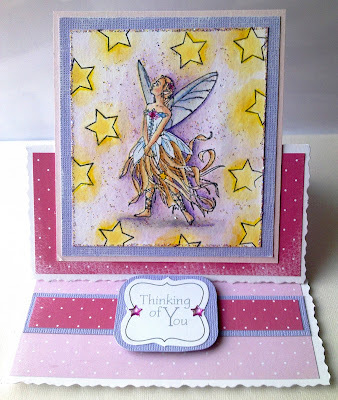 Carol - I've used the gorgeous Silver Fairy by Wee Stamps and coloured with Copics. The sentiment and papers are from the beautiful Pretty Sweet cd rom. Lana - I have used papers from the very girly - 'Pretty Sweet' CD. I'm a sucker for dots on my creations so this was perfect to compliment my little fairy which is a digi from All that Scraps. 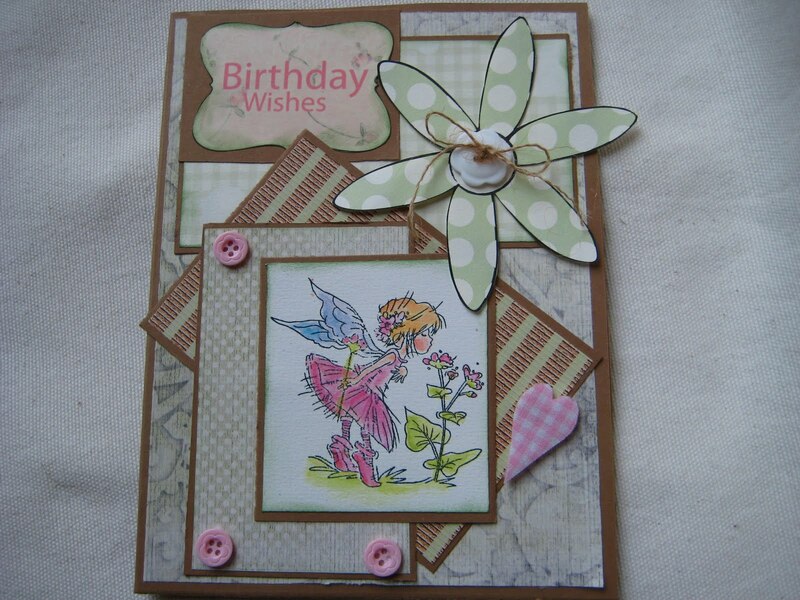 I also used the beautiful soft 'leaf' patterned paper for the grass punch. The sentiment was created on my PC and the image was coloured using copics. I added glitter dust to her wings. 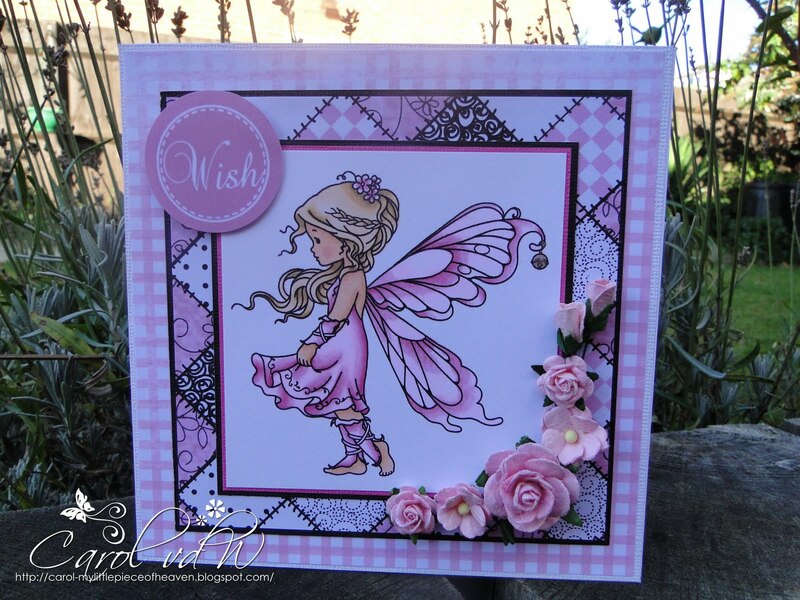 Clare - When I saw the papers in the Pretty Sweet mini collection, I fell in love with this beautiful design and this fabulous colour caught my eye. 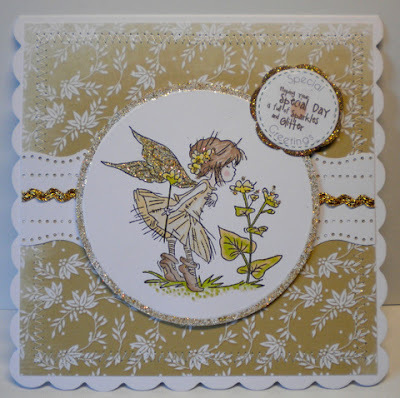 I usually colour fairies in pinks and purples so it was lovely change to use yellows, browns and greens. 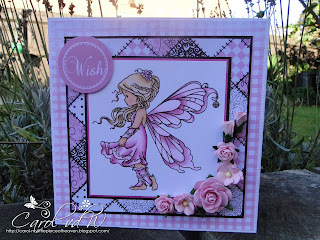 The sentiment is also from the Pretty Sweet mini collection and the fairy is from Lili of the Valley. 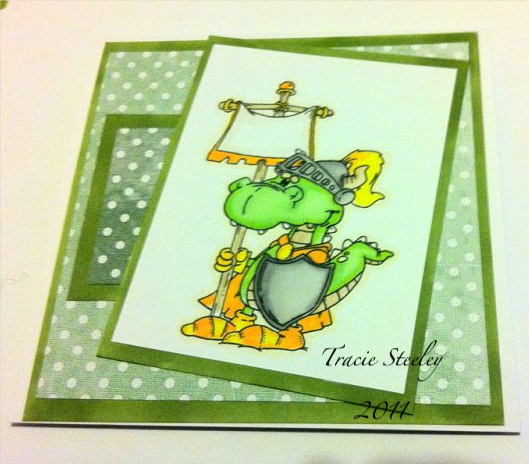 Tracie: I used a cute dragon image from Dustin Pike, coloured with promarkers. Then added some papers from the gorgeous Pretty Tuff CD. Emma Hello there, this time I used papers and sentiment from the Pretty Sweet CD, I coloured wth Distress inks and pencils, then glittered with stickles. Josie: This week I used a Lili of the Valley Stamp. Coloured with Pro Markers. On the wings and the embellishments I used Cosmic Shimmer Glitter. The backing paper is from the Pretty Sweet CD Rom. The sentiment is written in Wink Of Stella Pens. Good luck with the challenge! Please remember our rules and the deadline is Sunday 6 November at 12noon GMT. Hi everyone, before we get to this week's challenge we also have some very very exciting news this week about the Design Team Call. We had over 100 entries this time round from lots and lots of extremely talented people, but sadly we can't choose everyone and you have no idea how difficult it was choosing this time round, we really do appreciate your efforts and feel privileged to know that so many people would love to be on the team. There were so many fabulous peeps we just couldnt let them go! Everyone who applied should have had an email by now (so please check your inboxes if you haven't, we are still waiting for a couple of people to confirm their acceptance),PLUS we also have 5 Guest Designers coming to play with us soon too - we think we now have one of the biggest Design Teams in the Universe! Don't forget - we're still waiting to hear back from 2 of you so go check your emails now! Congratulations goes to Nelly S who won our first prize, and our runners up are Michaela and La Diva - well done everyone, please email for your prizes and blinkies! So, it's my turn to set a Spookylish challenge this week! Well, it had to be didn't it really! First of all we have some GIVEAWAY CANDY up for grabs too - the winning entry of this week's magical spooky challenge will win a copy of our fabulous Sundae of Seasons CD - over 4000 images to play with! Yes, 4000!! Wowser!! 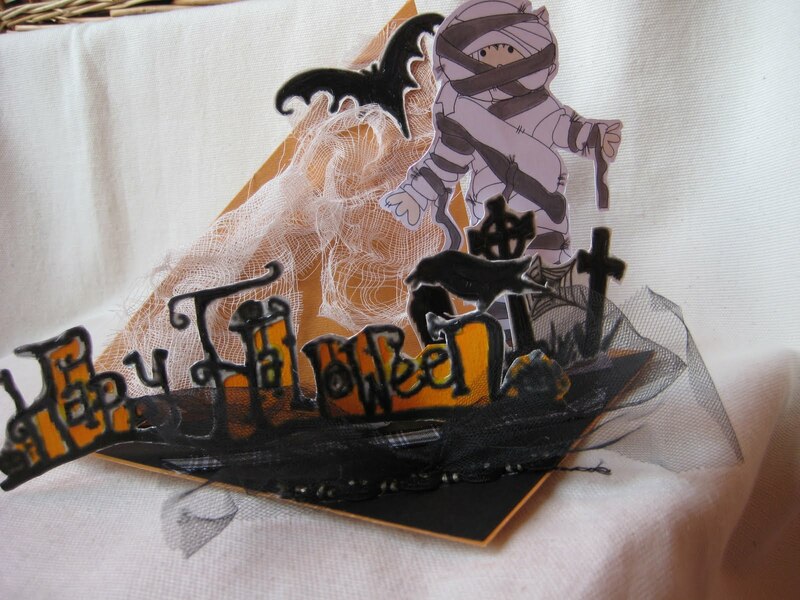 So this week's challenge, quite simply, is to make something for Halloween, BUT you MUST use some element from the special download above (just right-click to save to your PC) to make your project OR you can use elements from the Polkadoodles Sundae of Seasons CD too if you prefer. Just right-click the image above and save to your computer, this is a hi-res PNG image so if you like to manipulate your images through a graphics program you can do so easily. Daniele......for my halloween hanger I have used an image from The Sundae of Seasons Cd and the sentiment is from the free download, I've used distress inks for the background of the image and Prismas to colour the image. 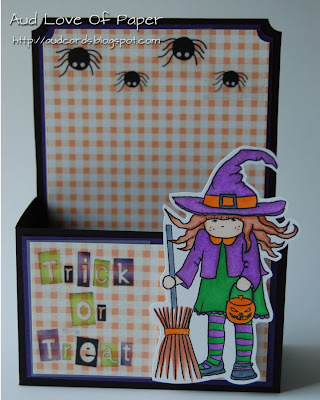 Audrey... For this treat box I used the adorable free Halloween download for the sweet little witch that I colored with Copics and Sundae Of Seasons for the paper, sentiments and spiders. I printed them on Safmat. 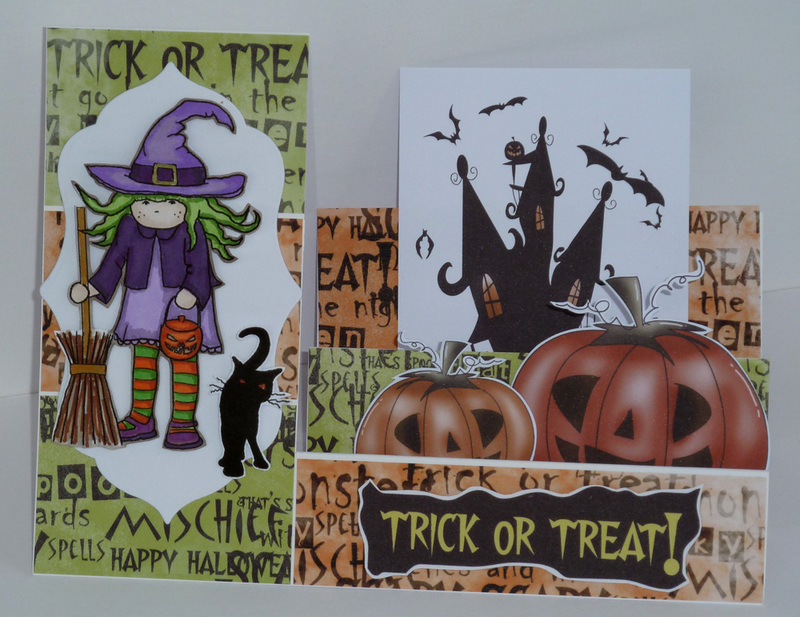 Fliss - I've made a side step card using the cute little witch and adorable cat from the download, colouring with Promarkers (I couldn't resist giving my witch some rather cool green hair lol). The sentiment and the Halloween papers are from the Polly Witchydoodles Halloween Bundle download and the pumpkins and haunted house are from the Sundae Of Seasons CD. 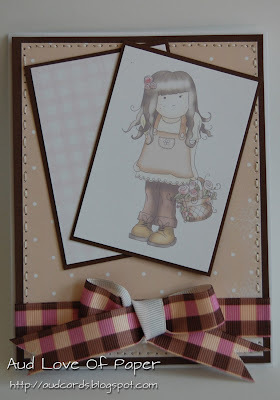 Louise On my card this week I have used all the elements from the free download (could not pick so had them all lol). My image is coloured with copics and I used distress inks to change the colours on the wording. Josie: I used a CD backing paper (i cant remember which one!) as well as house stamps and a fairy flutterby. All coloured with promarkers. I also went over the black parts with cosmic shimmer glitter. Alan: I have never made a tunnel card so l thought The Halloween download and the Sundae of Seasons gave me the opportunity to make one. The only other item l used was a perfect backing paper from the Not for Girls - Definitely for Men cd. Miria. 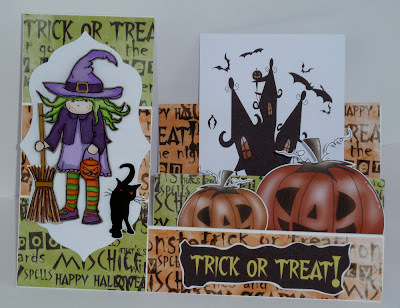 For my easel twisted card I used some images from Halloween download, coloured with Promarkers and added glossy accents to give dimension. The mummy is from Sundae of Seasons, I coloured it with Promarkers again and used Ultrafine nibs. I added ribbons, button and cheese cloth. Dee: I've used some of the download elements onto pumpkins from A Sundae Of Seasons CD. I used backing papers from last years Halloween downloads, but I decided the spiders looked more friendly and more like they were bouncing when they were upside down, so I just added some squiggly lines to them. Colette - I have used the cute little witch and halloween word art from the freebie download, along with papers from the Wonderland Paper Adventure CD. I have coloured the little witch digitally in Photoshop. The frames are cut with X-Cut Ornate Bookplate dies, and the borders are Spellbinders Ironworks Accents, I have used the waste left over after cutting the centre borders to make the top and bottom borders. Hello there, welcome to a new week and a new challenge, this time your challenge has been set by me, Emma. 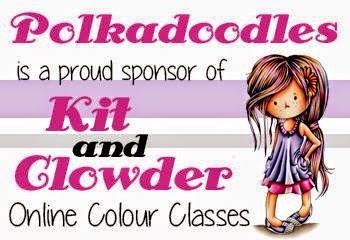 So, this week, it is nice and easy, you can use any image, any colours and any style, just use ribbons and bows to embellish. Congratulations! Please email Nikky for your blinkies! The first placed winner receives a download from Polkadoodles. Please put in the subject field of your email your placing and the challenge number - this will make Nikky's life a lot easier! The challenge is open until Sunday 23 October at 12noon GMT and any entries that do not follow our challenge rules will not be eligible for any prizes so please read them carefully! If you want more detail on how the Design Team have created their projects, just click on their name and you'll be taken to their blog. Audrey... For this card I used the CD Pretty Sweet. I did some stitching around the edges and used ribbon from my stash for the bow. A very clean and simple card. Emma, hello, I have used a gorgeous Garden Neighbours stamp this time, stamped onto kraft paper and coloured with pencils. The backing paper is from the Sundae of Seasons Cd and the sentiment is Sensational Sentiments. Embellished with some co-ordinating ribbon, peel off stitching, glitter glue and Doodle Dewdrops. Louise: For my card this week I have used the new mini CD called Pretty sweet and the designs are very sweet.I have coloured my image with copics and added a little ribbon and bow. The sentiment is from the sensational sentiment set. Claire For my Kraft gift bag I have used one of those gorgeous Pretty Sweet girls along with sentiment and paper from the cd. I have coloured her with Promarkers and used my ribbon to create hair bows! 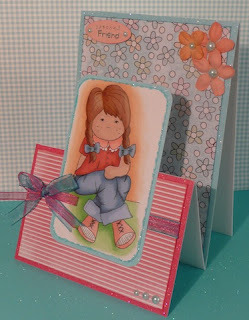 Colette - Another Pretty Sweet card, the papers and images are just so hard to resist! The flowers are made from punches, the ribbon is narrow silk ribbon from stash, which is curled and held in place with little gems. 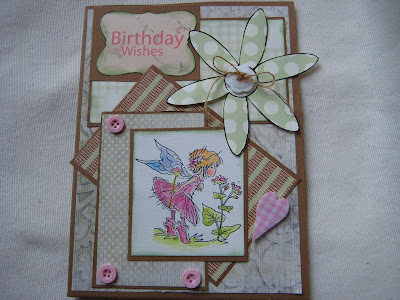 Fliss - For my card I too have used the adorable new Pretty Sweet CD and have chosen a patchwork effect. I trimmed squares of the gorgeous rosebud paper with pinking shears and added faux stitching. I finished off with the lovely Amelia and her basket of roses cut out with an oval cutter on a pink dotty paper mat and a wired ribbon bow. Miria For my card I used a lovely Pretty Sweet again, coloured with Distress. The papers are from the same cd, the sentiment is handwritten, ribbon, doily and pearls from stash. Josie: This week I used the Image and backing papers from the Pretty Sweet CD Rom. I used the clear Wink of Stella pen to high light her bows, and then covered in Glossy accents. 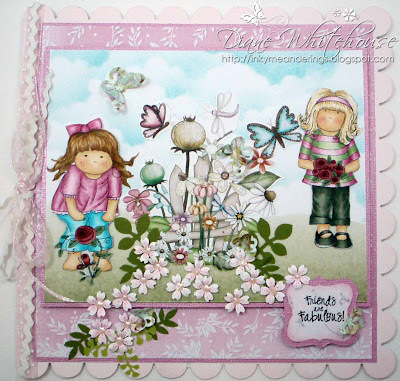 I coloured the image, sentiment, flowers and ribbons with Pro Markers. 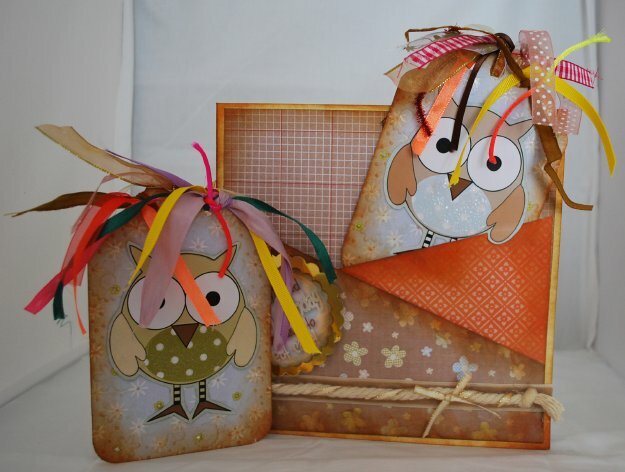 Ruth: I too have used Pretty Sweet cd - the papers and image are both from the cd. A bit of faux stitching added plus some ribbons and that's it! 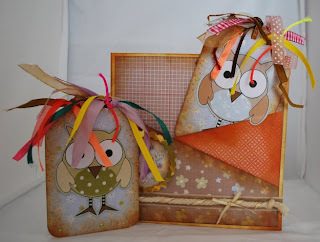 The Owls were from the cd SUGAR BIRDIES. I secured the Owls onto their own tag and then after punching a hole l threaded lost of ribbon through it. The ribbon at the bottom was just a short piece of cord knotted each end then a smaller ribbon wrapped round it. The images were not coloured in just printed out and then carefully cut out. Each owl had its own pocket. All the edges of the papers were inked with a distressing ink. Week 40 Challenge - Handmade Flowers & Blog Candy! 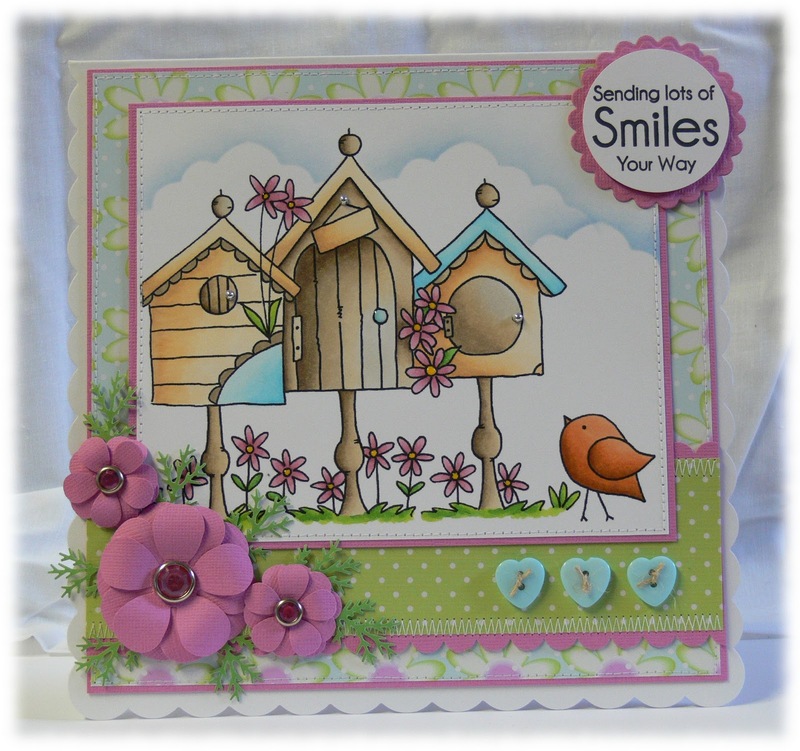 Hello, it's Fliss here this week as it's my turn to set the challenge theme. Those of you that know me will be aware that I'm a big fan of DIY (making my own decorated papers and embellies I mean lol) so my challenge to you is to add some HANDMADE FLOWERS to your creation. 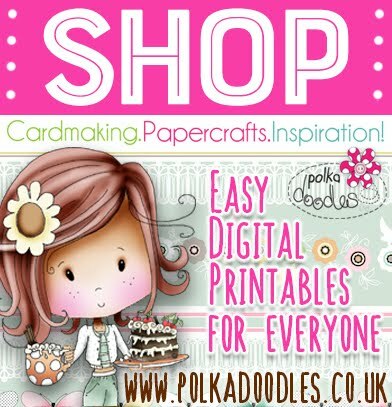 These can be made by punching, die cutting, stamping, decoupage and so on - the choice is yours. GIVEAWAY!! 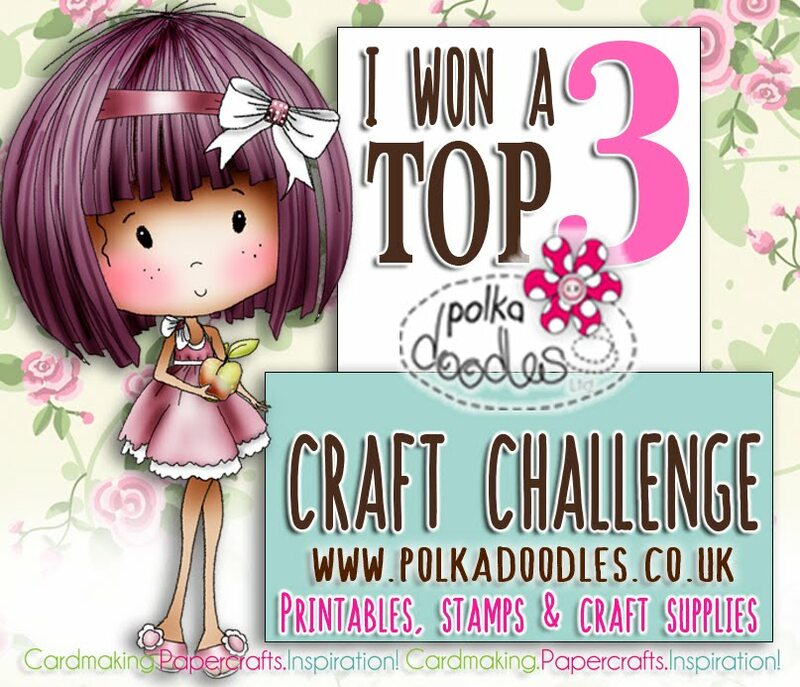 The winner of this week's challenge will also win 3 Polkadoodles stamps - HURRAH!! LOADS of giveaways this month!!! 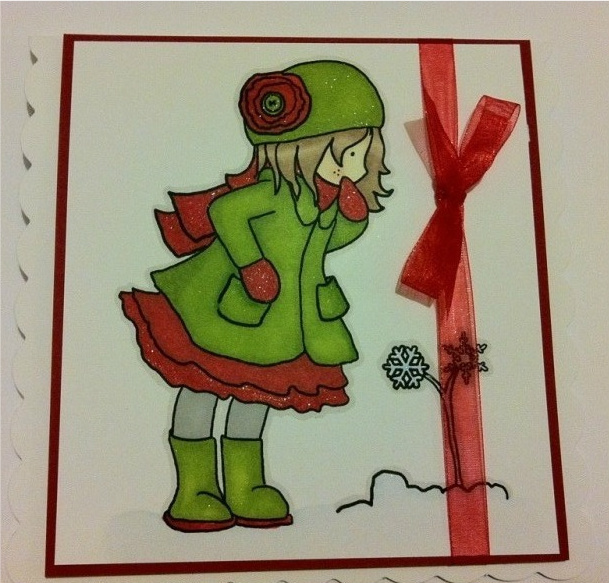 First Place: Joanna K - Joanna wins a set of brand new Letraset Flexmarkers - woohoooo, well done Joanna! The challenge is open until Sunday 16 October at 12noon GMT and any entries that do not follow our challenge rules will not be eligible for any prizes so please read them carefully! Fliss - I've made a very pretty vintage style shaped card using elements all from the A Double Sprinkle Of Kraft CD. I coloured the image of the little girl with pencils and used a blending solution and paper stump to blend the colours. My handmade flower is made using a punch and emboss flower punch and I exaggerated the embossing with an embossing ball tool and rounded out the petals. I used silk flower stamens in the centre. Daniele. 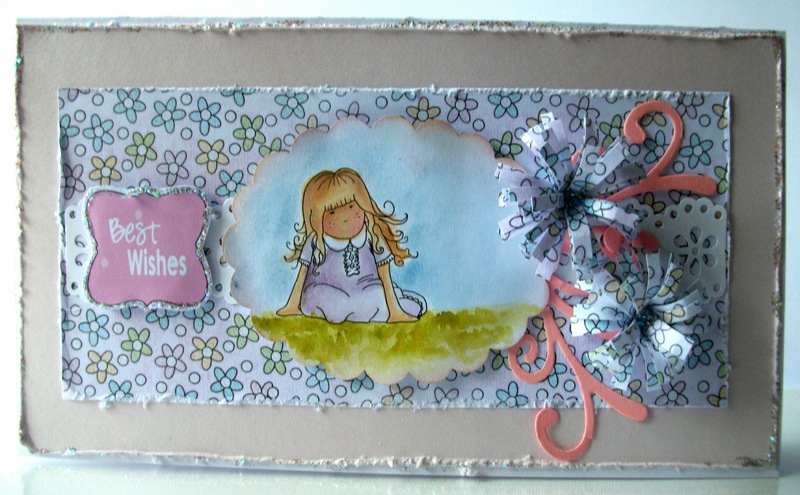 So love the new CD Pretty Sweet Girl so this weeks card features the sweet Maddie, the papers are also from the same CD, flowers were made using a punch with added pearls. Audrey... For this card I used the new CD Pretty Sweet Girl for the adorable little girl and All Around And Everywhere for the background paper and the paper for the flowers. I used my Cricut to cut out the flowers and inked the edges to distress them a little. I sewed around the edges with floss and added some buttons and twine to the flowers. Alan I made some flowers out of the cd plastic covers that are put onto those 'Rings of cds' that we buy. Would a Bigz Die and my Big Shot work? THEY DID!!!! After 3 sets cut out they were coloured in by using Alcohol inks. 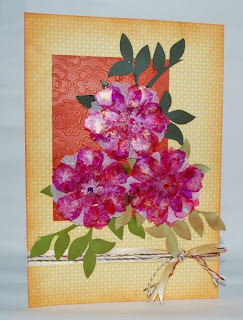 To give some height I cut out two vellum flowers and crumpled them up glued under and then secured onto the card. All the papers l used on the challenge were from the Sundae of Seasons CD. Enfys: I used Pretty Sweet for mine as well, and my flowers couldn't be more simple, I wanted them to look sketchy and doodly, so I cut them with my Cricut and just doodled around the edges, adding Card Candi to the centres. The gingham paper that I used prints out with that great whitewash border, looks as if I spent hours with the acrylic paints, but it was instant gratification! 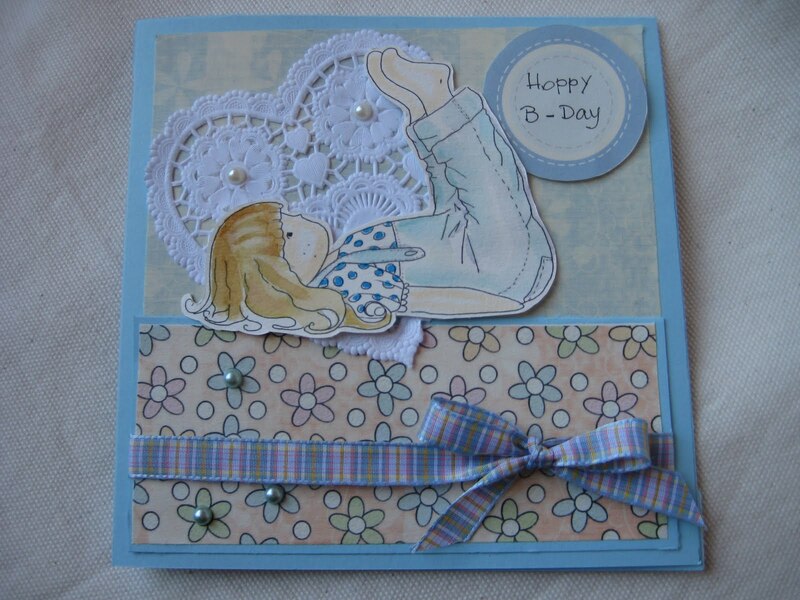 Dee: Another card made with the new CD Pretty sweet from me as well. 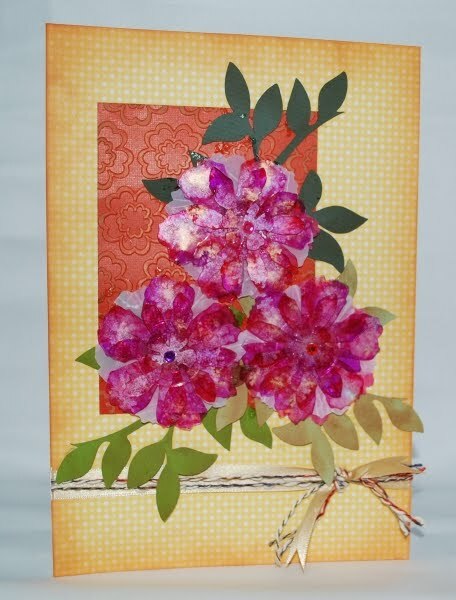 The roses are made from swirls of backing papers. Some inking and die cut leaves finish it off. Miria For my card I used one image from new lovely cd Pretty Sweet printed on Kraft and coloured with A wink of Stella, the sentiment and papers are from the same cd. The flower is handmade using punches, brads and lace from stash. Diane - I am also focusing on the Pretty Sweet CD so that will probably indicate how much in love all of the DT are with this one! I've printed two of the lovely girlies and coloured them with my Copics. Then I printed the coloured version of the flowery fence from the Summer section of Sundae of Seasons and combined them all onto a very summery background. Instructions for how to make the flowers are on my blog. 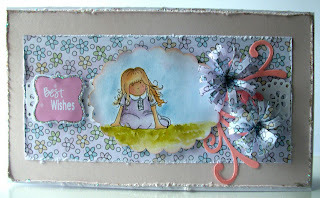 Colette - Yet another card made using the Pretty Sweet CD, I just love the yumminess of the papers and girls. I have made a scalloped tent card, to make my flowers I printed one of the paper designs from the CD onto both sides of a piece of paper and using the Marianne Creatables Chinese rose die cut out three roses, made them up and then brushed glue over the top and sprinkled with glitter. 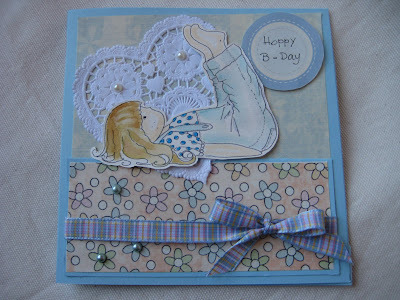 The swirl is also a Marianne Creatables die and ribbon is from stash. Josie: This week I used the digi image and papers from the Pretty Sweet CD Rom. I absolutely love this CD Rom!! I coloured the image with Pro Markers. I punched different size flowers out of some co-ordinating papers on the cd rom and over lapped them. I added a gem in the middle and some cosmic shimmer on the petals and around the sentiment. I went over the flowers with the clear Wink of Stella and then covered with glossy accents. Emma I have used Pretty Sweet too, the handmade flowers were just made from fringed paper and the image was coloured with Distress inks. Ruth: I've broken with tradition and gone for Fairy Flutterby Maggie stamp which has been coloured with Promarkers. It's not often I make an easel card as I'm hopeless with getting things straight, so I made a larger centre panel and it all worked fine! Papers are from Pretty Sweet and I've made my own flowers with raffia and lots of glue! Claire I used lots of Polka Doodles stamps to create my picture, and my flowers are punched Polka doodles papers from the simply sweet cd with fimo centres. Coloured and inked with added pearly doodles. Good luck with the challenge - you have until Sunday 16 October at 12noon GMT to get your entry in and please remember our rules!